Today, we face a different type of performance – one that is not ‘just’ dependable but one that is often unpredictable, one that seems perhaps more suited to innovation that outsmarts others in unique ways. We need to be predictable in performance but we need to deliver unpredictable innovation that wows our customers and the markets to achieve this. To do this you have to run today’s organizations faster, better, in more active and engaged ways to extract the best from it but to allow it to exploit options consistently and with clear purpose. This engagement needs a different honing than most organizations are certainly not capable of delivering, without thinking long and hard about the way they must undertake a more transformational pathway. One that can connect and deliver a consistent and coherent innovating performance across the organization. Managing innovation well is this middle way. Innovation requires careful managing. I like to put the emphasis of innovation behind both efficiency in innovation and effectiveness in innovation. Innovation may never be simply predictable but it can be well-managed, to extract and leverage its best performance but to achieve this it needs a highly focused top management engagement. Often we are not seeing this in many organizations today. You simply can’t delegate innovation down the organization. Innovation needs to be as aligned, as honed to strategy, to extracting from its available resources as anything else in organizations. It needs connecting, it needs articulating, it needs framing, it needs cascading throughout the organization. I believe there is an essential gap within the way we set about innovation today. 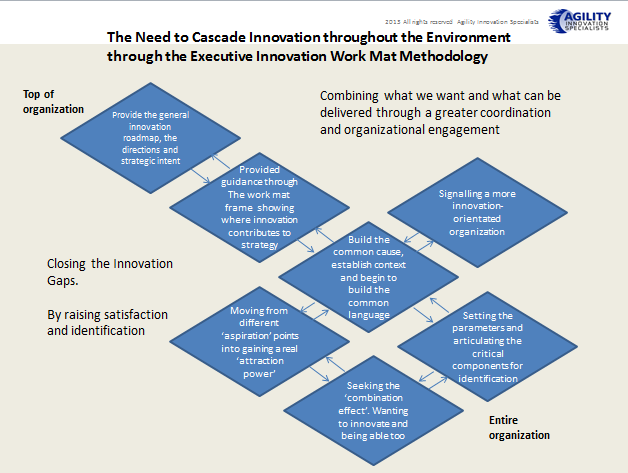 There is a need for a well-articulated and well-communicated innovation strategy that can be delivered in an organizing framework that has been called the Executive Innovation Work Mat. Over a series of articles and blog posts I have laid out the Value Proposition for this. In obtaining the right innovation engagement at the top of our organizations, well communicated throughout the entire company, we reduce distance and bridge many current disconnects surrounding innovation. We consistently raise performance. I’ve previously written on the cascading effect needed for innovation success looking at two-way flows and the value of closer alignment. We need to leverage across the entire ecosystem that makes up the organizations place where we consciously work on immediate impact points in this year’s innovation outcomes but also what is going to give us this longer-term transformational effect. This requires that huge emphasis on collaborative efforts, on promoting behaviours and matching understanding within a greater transparent organization climate and culture. We need to align, offer clear vision and purpose and this needs orchestrating from the top of the organization to the bottom. Organizations need an integrated innovation strategic framework that can deliver commonality in understanding, in purpose, in language. We need to cascade. 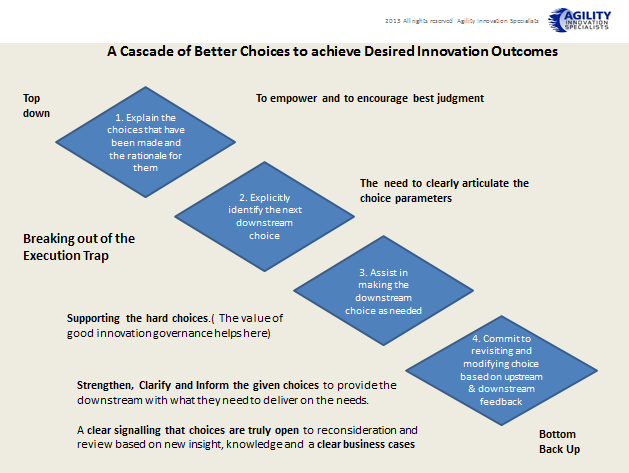 What we are looking for is a cascade of better choices to achieve the desired innovation outcomes that only an integrated innovation design can achieve. This is where the engagement from the top of the organization becomes pivotal. They ‘frame’ the design; they offer the alignment and integrated approach I believe the Executive Innovation Work Mat methodology can provide. 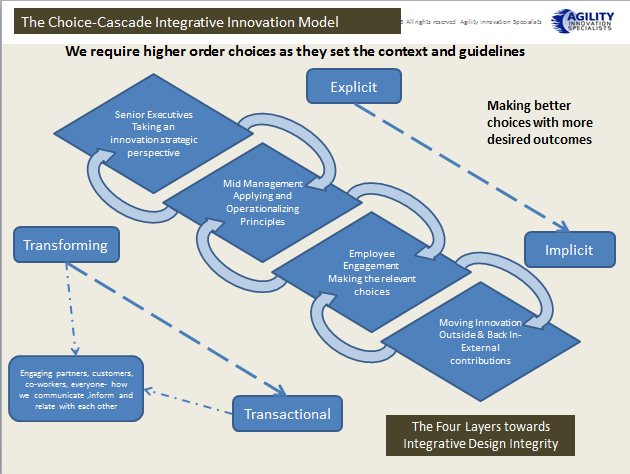 Through this cascading-effect you move closer to better choices that can get so much closer to the desired innovation outcomes all involved want to seek out. A performance that reflects a team’s or organizations best efforts to be best at what they do; the outstanding innovation performance consistent to the needs and growth expectations demanded in today’s constantly changing world. Where consistency needs to be fluid, flexible, aligned and being agile in innovation – that’s the new target performance standard needed. This entry was posted in Uncategorized and tagged cascading effect on innovation, Common lanaguage for innovation, components of a innovation framework, deploy a innovation framework, dynamics of innovation, executive innovation work mat, implications of innovation, innovation management needs, Innovation Structure, leaders work mat, shared understanding of innovation. Bookmark the permalink. Innovation can be broadly defined as In + ovation. that means if I can pay respect to my own thoughts, than only I can share them among my peers because those become rational. Through exchange of views and ideas innovations can be carried out.